This relatively new wall is a gem. It’s called Never Sleeping Wall and is found in the extreme northwest tip of Sicily only 500m from the sea. It was first developed as recently as 2008 by Brit Jim Titt and some Czech and Italian friends who were there at the same time, and further extended in Autumn 2009 by some Austrian climbers. Never Sleeping is a fantastic limestone wall that positively glows in the clear Mediterranean light, particularly as the sun drops. Climbing a glowing bright red 50m route on the wall at sunset has to be one of the more surreal moments of this fantastic place. At present there are 14 routes, from 5b to 8a+, with Tears of Freedom ranking as one of the most beautiful 7a+ in the world. This is not all that Sicily has to offer. Messina consists of 8 separate limestone crags, some of which offer multi-pitch bolted routes up to 150m long. The largest crag is at Castelmola, near Taormina, which offers single pitch sports climbing with nearly 50-recorded routes across a good selection of grades. Of course Taormina also hosts the famous Mt. Etna – Europe’s highest (3,329 metre) and most active volcano. In ancient Greek mythology, Etna was identified with the forge of Volcan. It’s height varies with summit eruptions; the mountain is 21 m (69 ft) lower now than it was in 1981, but it is still the highest mountain in Italy south of the Alps. Although the Etna volcano is one of the world’s most studied volcanoes, it is difficult to classify, being a mixture of overlapping shield and strato volcanoes, partially destroyed by repeated caldera collapse, and partially buried by younger volcanic structures. The last eruption, a flank one, was in 2008. The eruption started on the morning of 13 May 2008 immediately to the east of Etna’s summit craters, accompanied by a swarm of more than 200 earthquakes and significant ground deformation in the summit area. On the afternoon of the same day, a new eruptive fissure opened at about 2800 m above sea-level, with emission of lava flows toward the Valle del Bove. During the following 24 hours the lava traveled approximately 6 km to the east, but thereafter its advance slowed and stopped. On 13 November 2008, six months after its onset, the 2008 flank eruption of Etna was continuing, at a relatively low rate, and it thus became the longest of the four flank eruptions of Etna so far in the 3rd millennium. … is to be found in the sunny Mediterranean. Bizarre isn’t it? So why have I mentioned it? It’s not a classic climb – crags and walls and all that sort of stuff, but it is a hike, so if you’re in the area and what a challenge with a difference then there’s one on your doorstep, but please remember that although Mt. Etna is not usually dangerous, it must always be approached with intelligence and care. Monte Pellegrino, which rises up within the city of Palermo, has the largest concentration of routes in this area. This mountain is over 600m high and extends from south to north for several kilometres, offering a continuous sequence of limestone walls exposed on every side. The majority of the climbing is on the west side of the mountain and in all there are 8 major crags, offering single pitch and multi-pitch routes up to 200m long. There are more than 200 sports routes here, as well as long classic routes, making it the most important rock climbing area in southern Italy. The area has still not been fully developed and there are still long stretches of untouched walls. To the north of Palermo and rising from the sea is Monte Gallo. It is an isolated mountain consisting of a number of different peaks, with some walls up to 400m high. The mountain is rugged and the walls are steep. All of the routes are multi-pitch giving big wall bolted routes up to 370m long on good quality limestone rock. Near Trapani is one of the most famous seaside resorts of Sicily called San Vito Lo Capo. Here there are large mountains that fall straight down into the sea offering fantastic rock climbing. On Monte Monaco there are bolted multi-pitch routes between 150m to 400m long as well as single-pitch sports routes. The rock here is limestone and the grades of the routes are mainly in the 6’s and 7’s. This area is to the south-east of the island and has a large concentration of crags between the 2 towns. They are mainly a good selection of single pitch sports routes. However at Monti Climiti there are bolted routes up to 100m long with 8 different crags spread out on 3 sides of the mountain. There are not many routes on each crag, but the crags are close together so you can easily and quickly drive from one to the next to make the most of the single pitch routes as well as bolted multi-pitch routes across all grades on limestone rock (deodatdolomeu). 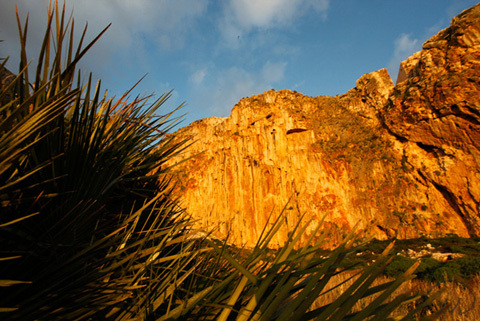 The ideal time to visit Sicily to go rock climbing is from autumn right through to spring. It is not unusual to be climbing in shorts and t-shirt on beautiful crags overlooking the sea during the winter months. Access to Sicily is easy: Ryanair flies daily from Stanstead to Palermo and there are flights from Birmingham to Birgi (near Trapani and 66km from San Vito) on Wednesdays and Sundays. Easyjet also flies into Palermo from Gatwick on Tues, Thurs, Sat (and Sunday depending on summer or winter season).